Elegant clear crystal chic light chain for indoor use. 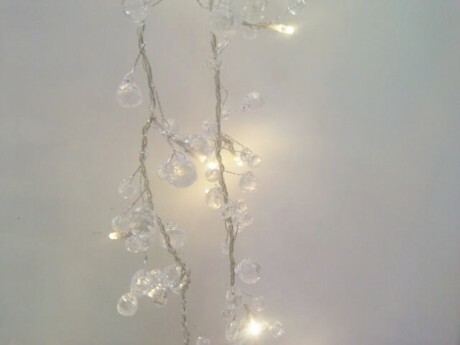 This delicate crystal effect LED light chain has many uses around the home. Use in place of a candle in the centre of your dining room table. Lighten up a dark corner in any room of the home, or drape across the mantelpiece or display in an unused fireplace. Place a battery operated crystal chic light chain in a glass bowl to create a stunning display. Battery operated: 27 LED bulbs, total length 2.2 meter of which 1.7m illuminated. Requires 3 X AA batteries. Mains powered: 50 LED bulbs, total length 6m of which 3m illuminated. Includes Transformer.